What are you gonna do with your salary at the end of this month and the one after that? 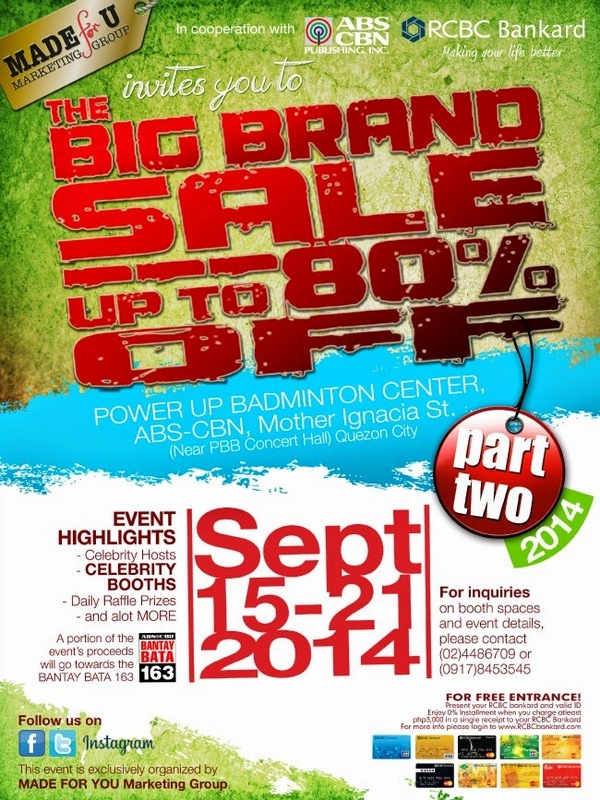 Save it then splurge at the 2nd leg of The Big Brand Sale this September 15-21, 2014 at the POWER UP Badminton Center, Abs-Cbn, Mother Ignacia St (near PBB concert hall), Quezon City! As of now, we don't have the official list of participating brands yet but it's probably the same roster as the last (see HERE) with a few more added as bonus. With that being said, expect to find goodies from old favorites such as Nike, Ray-Ban, Pepe Jeans, Nine West, FCUK, Gingersnaps, Esprit, Case Logic, Guess, Samsung, Philips, Giordano, Just G, Wenger, Shubizz and many more at up to 80% off!!! Aside from being able to shop for great bargains, lots of prizes will also be given away daily! And like what I mentioned earlier, the Giveaway! OR be one of the first 1000 to like and repost this photo from the Made For U Group's Instagram account to win a FREE ONE-WEEK PASS or 1 of 3 D&G Light Blue Perfumes if you're one of their lucky followers with the best caption! 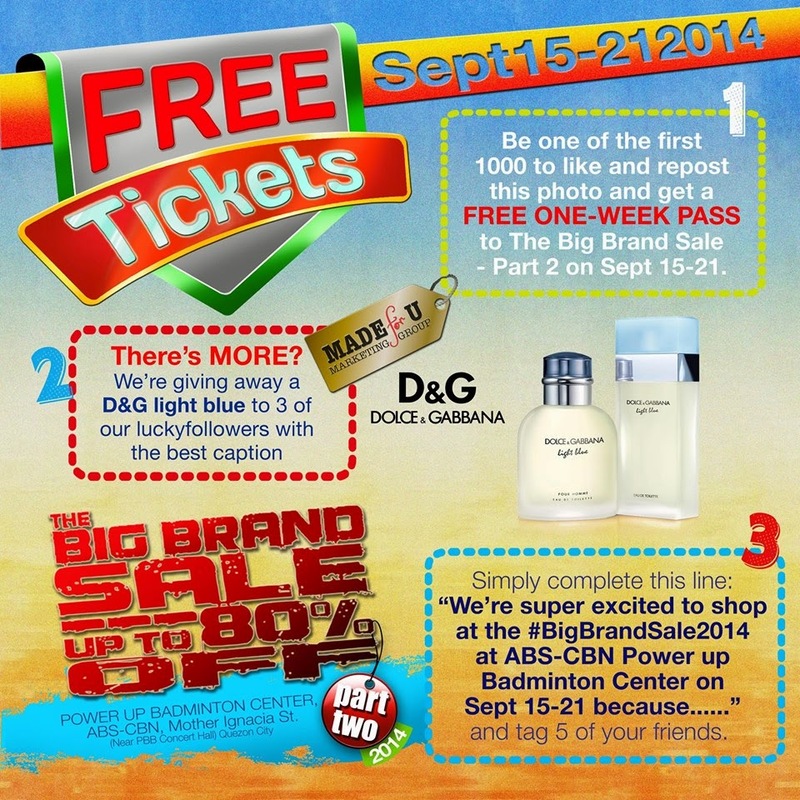 Don't forget to use the hashtag #BigBrandSale2014 to qualify. See poster above for more details and don't forget to follow @MadeForYouMarketing on Instagram! Wow, I like this, esp the bottom. It looks super duper thick. I am Rev. Fr. Kevin Doran, a Reputable, Legitimate, Certified, Reliable & an accredited money Lender. I loan money out to individuals and corporate bodies in need of financial assistance. Do you have a bad credit or are you in need of money to pay bills? I want to use this medium to inform you that i render reliable beneficiary assistance as I'll be glad to offer you a loan at 2% interest flat rate. What did your bank say concerning having a loan from them???? Don't feel disappointed if they refuse granting you a loan. I hate what the banks do when customers/consumers are willing to lend money even with collateral and valid documents. I look forward permitting me to be of service to you. Send me an- E-mail me by replying to my email consumerloanfirm@gmail.com and I'll do my best to help you out in your bad finances situation.